1. Preheat your oven to 375°F (190°C). In a large bowl, add the ground turkey, Parmesan, garlic and parsley. Season well with salt and pepper and stir to combine. 2. Using 2 tablespoons of the chicken mixture, form into meatballs and transfer to a baking sheet coated with a little oil. 3. Bake until the meatballs are cooked through. This should take about 15 minutes. 1. In a saucepan over medium-high heat, warm the oil. Add the onion and garlic and saute until the onion is translucent, about 5 minutes. 2. Add the red pepper flakes. Season with salt and pepper and saute about 2 minutes. 3. Add the tomatoes with their juices and bring to a boil. Reduce the heat to low and simmer for 25 minutes. Adjust seasoning with salt and pepper. 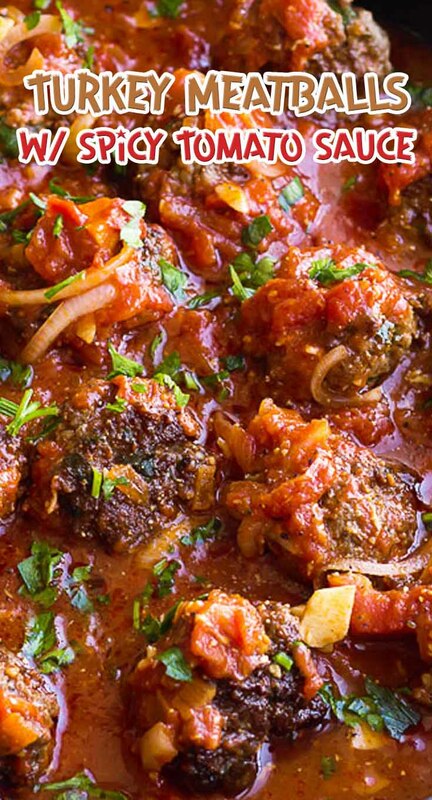 Serve the turkey meatballs over bulgur or rice. Ladle tomato sauce on top and garnish with fresh parsley.